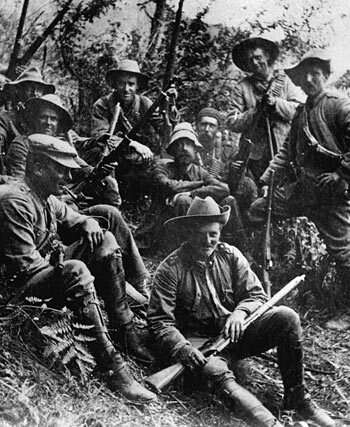 The South African War, which began in 1899, was the first war to which New Zealand sent soldiers to fight overseas. The country saw it as an opportunity to show its loyalty to Britain, and to show off their strong and adaptable soldiers. The South African War was between Britain and the two Boer republics of South Africa (Transvaal and the Orange Free State). The Boer were descendents of mainly Dutch settlers. The war was over voting rights and land – Transvaal had major gold and diamond mines. Most New Zealanders were very keen to send troops to support Britain, as Pākehā were almost all of British descent. This was the first war where New Zealand sent troops overseas. Over the three years of the war New Zealand send 10 contingents, a total of about 6,500 soldiers. The first contingent left New Zealand only eight days after war was officially declared. It was considered to be a ‘white man’s war’, so only a few Māori soliders served. At least 35 women went to South Africa as nurses, but most of them had to pay their own way. At the end of the war 20 women went to teach Boer children in the concentration camps they had been held in by the British. Only a month after they arrived in South Africa, New Zealand troops were involved in a battle where they drove away Boer troops. The hill where the battle took place became known as New Zealand Hill. At the end of the first year of the war it seemed that the British had conquered the Boer republics, but Boer troops kept fighting in smaller guerrilla groups. To try to cut off the Boer fighters’ food and supplies, the British destroyed Boer farms and imprisoned women and children in concentration camps. Many died from disease. In 1902 the war was over, and the British had won. New Zealand soldiers did not get much training before fighting. They had poor equipment, not enough rations (food) and their clothes quickly became ragged. There was a lot of illness – of the 230 New Zealand soldiers who died in the war, more than half (133) died of disease. However, the New Zealand troops became known as good, strong soldiers, who could adapt to many situations. The war unleashed a tide of patriotism, and New Zealanders saw themselves as strongly tied to the British Empire. Because of the high reputation New Zealand troops gained in the war, the country developed a tradition of having a ‘volunteer’ army rather than a large professional one. Compulsory military training for boys began soon after the war. Memorials to the soldiers who fought in the war were put up around New Zealand.